The Spring School is particularly suitable for Master and PhD students in mathematical and theoretical physics. It provides the opportunity to learn more about a new and interesting topic at the intersection of quantum theory and relativity. Which evolution equations for psi are appropriate? In which cases are these equations consistent? How can one implement interaction? Can one re-formulate quantum field theory using multi-time wave functions? What is the relation of psi with physical experiments? Does |psi|^2 represent a probability density? In the Spring School, we will develop the topic of multi-time wave functions from scratch, answering the above-mentioned questions. Exercise sessions will complement the lectures. Prerequisites are: background knowledge of calculus, quantum mechanics, and relativity. Venue: Campus Auf der Morgenstelle, C-building (Fachbereich Mathematik), room N14 (ground floor). Registration: please send an email to register! Funding: External participants can apply for a contribution towards their traveling and accommodation expenses. Please indicate if you wish to apply in your registration email. 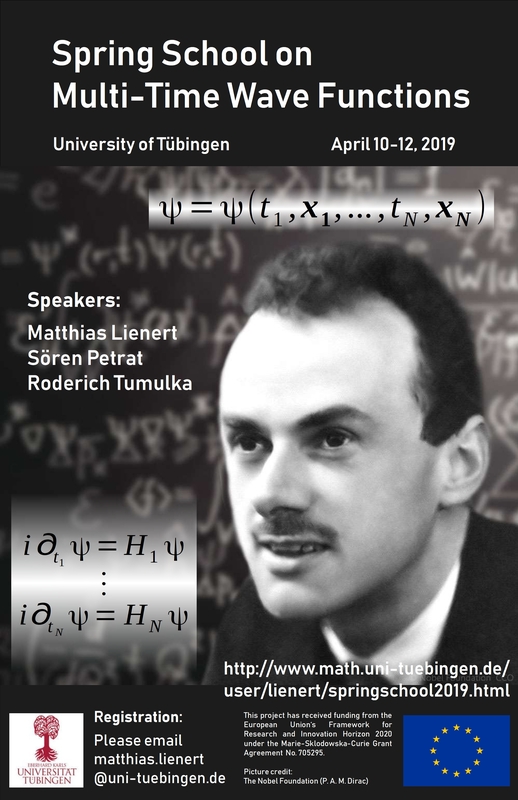 A multi-time model for quantum electrodynamics with fixed electron number P. A. M. Dirac, V. A. Fock and B. Podolsky: On Quantum Electrodynamics.In Julian Schwinger, editor,Selected Papers on Quantum Electrodynamics. Dover Publica-tions, 1958. Participants are expected to make their own arrangements for accommodation. In the city center of Tübingen, there are many hotels which are well-connected to public transport. The DJH Youth Hostel is a particularly affordable option. This project has received funding from the European Union's Framework for Research and Innovation "Horizon 2020" (2014-2020) under the Marie Sklodowska-Curie Grant Agreement No. 705295.